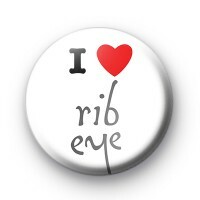 Custom i love rib eye badges for Ella Chivers at Ribeye. Standard white 25mm badge with black text, bold red love heart and the rib eye logo. 25mm pin badge hand made in our UK workshop using hand presses & locally sourced pin badge components.